Save a large amount of space in your living room thanks to the Full-Motion Articulating, Tilt/Swivel, Universal Wall Mount for 19&quot; to 84&quot; TVs. With creative innovations and a new design, the flat-panel TV wall mount can accommodate TVs ranging between 19&quot; and 84&quot;. Capable of supporting up to 132 lbs, this TV mount sits on the wall with a minimum clearance of 2.64&quot; and a maximum clearance of 19&quot;. The Full-Motion Articulating, Tilt/Swivel, Universal Wall Mount contains the capacity to swivel left and right up to 180 degrees. It also has the ability to tilt 12 degrees up and 12 degrees down. This TV wall mount takes your movie watching experience to a whole new level. 10-Foot HDMI 2.0 cable included. 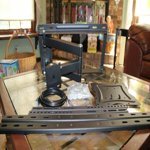 I was skeptical about the price and if it was a complete tv mount for the price!, and also if it would hold my tv! ha... WOW I have a 64" tv and it fits great! and I have no worries about it falling! Very Simple, mount wall bracket to 2 studs with lag bolts, attach other bracket to tv. and then hang the tv on the wall mount bracket. It took 30mins, 20mins to find the studs in the wall! Thats all! BUY THIS MOUNT!! I spent my time writing this. ITs that great. Goes flat on the wall, tilts, move it left or right easy, and extend it from the wall to. No complaints here. 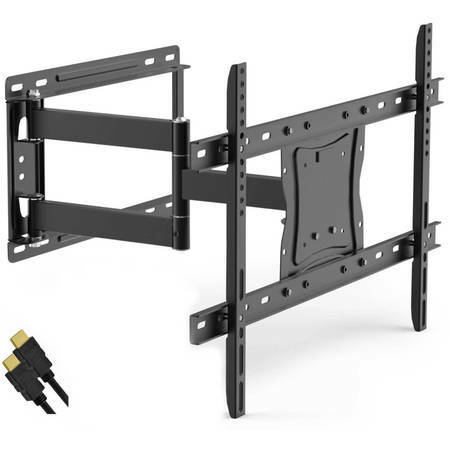 I chose this new Full Motion TV Wall Mount for 19” to 84” Tv's with tilt and swivel articulating arm with an hdmi cable and am pleasantly surprised. It is high quality made, stiff with precision moveability. 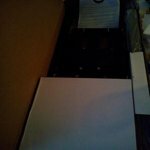 The box is somewhat heavy upon arrival and the unit was packaged well with all the components needed for an easy install. There are instructions provided that will make sense to anyone. I feel that you will really need to ensure you find a stud to mount this system into and possibly anchors to ensure it does not come off the wall. This should be a no brainer however, I can not stress enough how bad a safety issue this could be. Overall, the installation is easy upon finding the right location. Mounting my tv was not difficult. This is definitely a 2 person job if your flat screen is heavy. 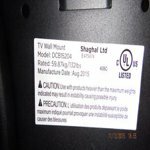 The hard textured metal frame work should not damage your tv if you mount it with care. Movement at first will be slow and precise at least it was on mine. 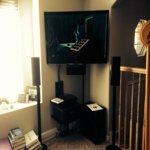 I am very happy with this full motion tv wall mount system and would definitely recommend it to anyone who wants one. The added HDMI cable is an added bonus! We have an 80" TV that we have always wanted to mount on the wall and now we can. This is a heavy duty item, not like so many we have seen at local stores. This device holds firm and steady without the fear that your TV will tumble. Our TV cost too much to trust just any mount. We have built a custom TV entertainment area with a heavy duty frame. I would suggest making sure your wall is capable of hold your large TV. We intend to purchase another for our other TV. Great product, looks great. This item is as it is advertised. Holds my 75" Samsung... No problem! I have to admit I was a little skeptical when I saw the small box UPS had just delivered on my front porch. But I opened it with care as to not damage the packaging so I could return it if my suspicions where true. The packaging included all hardware needed, the wall mount itself, an HDMI cable and instructions on how to install everything. The instructions could have been a little better, but still were pretty easy to follow. There is a bar code of sorts on the cover of the instructions.. So I went to the apple App Store, downloaded a free barcode scanner and the app used my phones camera to scan the barcode which took me straight to YouTube where a video started playing that showed how to install the new wall mount unit. The video is more or less an animated version of the instructions included in the package, there's no narrator, just video, but it's pretty simple. The hardest part of the job for us (my wife and me) was finding the studs in our old house. Nothing was 16" off center and our cheap stud detector wasn't cutting it. So we pulled a couple of strong earth magnets off our fridge and found the dry wall screws that way. We knew that the drywall would be fastened to the studs. We then found the center of the studs by using a very small drill bit and would drill into the wall on each side of the screw until we no longer hit wood. We then measured the distance between the two holes (that no longer hit wood) devided that in half and there was center. It's very important to find the center of the stud, especially the bigger and heavier your tv is, the lag bolts going into the studs, will be holding all the weight of your tv and your wall mount. Also if you drill small holes like us to find your stud edges, use a small drill bit so you can easily fill the holes with joint compound, spackling or even white tooth paste if you have nothing else. We also drilled these holes where we knew our tv mount would cover the holes. As far as the tools needed for installation, the instructions don't mention that you will need a socket and ratchet or at least a wrench for the lag bolts that go into the wall and a small one for adjusting the tilt (left/right and up/down) of the unit. I can't remember what size the socket was right now for the smaller size (tilt) but for the lag bolts(wall mounting bolts), we used a 1/2 inch socket. The parts bag itself, contained all screws, washers, bolts, spacers necessary for installation. It even includes an Allen wrench for the screws and bolts used to secure your tv to the wall mount itself. It helps if you know your VESA size on the back of your tv... VESA, is a standard size that most well known tv makers agreed to use so it would be easier for the consumer to buy aftermarket wall mounts and stands. But there are still different size VESA's. What was ours?? I had no idea, so I got on Google, typed in: What is the VESA on a UN75J6300 Samsung. And in an instant, I knew mine was 400x400. The reason it helped to know this was in the instructions, it let me know to skip step (A) and go straight to (B). All in all, it wasn't hard at all... It did take us about an hour and a half to install it, but most of that time was finding the studs. It did help to have two of us for this project too. The wall unit alone is not heavy, but I held it up against the wall with a level on it while my wife traced the inside of the lag bolt slot holes with a pencil. We then set the unit aside and knew where to pre-drill the holes. It was also a must to have both of us when lifting the 75" tv to marry the two halves of the wall mount together. 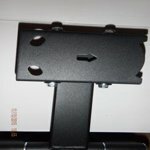 You will install part to the wall, and the other parts to the back of your tv... You then lift the tv up and place the two hooks of the part that you installed to the back of your tv, onto the v notches of the part mounted to the wall, then you fasten two screws in to fasten both parts to each other. Now is the time to use the smaller socket to loosen and or tighten the small nuts that will let you adjust the tilt up and down and side to side. I also had to loosen the two big locknuts on the arm itself.... Mine were so tight that the arm didn't want to unfold without a lot of effort. But a couple of turns with a wrench, and it swings freely now. This was not to difficult of a project for us and I think I only said a couple bad words during the entire process. I definitely would recommend this product. Awesome product at a great price. Shipping was fast and affordable too. I've got a 65" Samsung that weighs 70+ pounds hanging and I have no worries. I was nervous at first as the only thing that's not covered under warranty is the tv being dropped. This little mount is built solid and it's definitely a great buy. Hey you get a free hdmi cable too.....it was an easy purchase for me. Purchased this item primarily because of price point. I was able to purchase it for $50. It says that it can mount up to a 70" TV with a weight capacity of 132 lbs. I have only mounted a 50" and it appears to be stable and allows me to adjust the angle as needed up and down and left to right. So far I have nothing negative about this product. 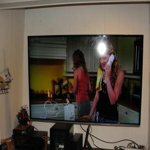 If I mount a 70" TV within weight capacity and it performs the same, then this product needs more than 5 stars for its price and functional ability as most mounts for larger TVs are in the $200 to $300 range. 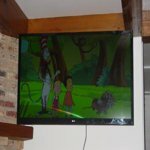 This was my second TV mount. First one was a stationary mount for a 47". Setting it up was not that hard as there was a large shelf beneath so I was able to put wood blocks to help me level it. I was able to use the top 2 hole of the previous mount as they were the same size and length. 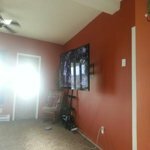 I leveled the mount to wall and had no problems hanging the TV with the help of one of my Grandson's. I really enjoy the way it swivels to the sides and the tilt is just at the correct degree. Only thing I had to buy was some extra flat washers at the Depot for the mount to attach firmly to the rear of my 58" TV as I couldn't use the spacers that came with it. The only other thing I would suggest as being helpful for people that are unfamiliar with putting up this TV mounts is a better close-up view of the instruction menu which is really to small to make out what screws/washers go where. This Full Motion TV Wall Mount with Tilt and Swivel Articulating Arm and HDMI Cable was a pleasant surprise. 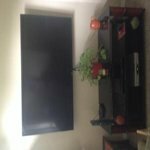 I was skeptical that it would work so well since the price was so reasonable as opposed to what others are charging and considering that you are hanging an expensive TV. This mount is a really solid and substantial item. 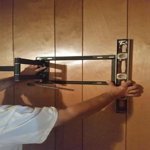 I found the product to be sturdy and well made and it was very easy to assemble and install. The mount is designed to bolt or screw to 2 wall studs on 16" centers or you can use included heavy duty anchors. 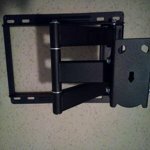 Then attach other bracket to TV, and simply hang the TV on the wall mount bracket. The bracket attached to the TV is adjustable for tilt. 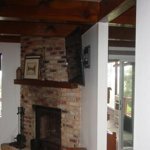 It swivels very nicely and pulls in and out easily. 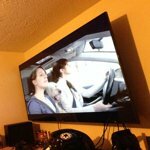 I mounted a 55" Vizio and honestly it took longer to work up my nerve than it did to install the mount. This was my first experience with mounting a TV since to date both of my TV's just stood on credenzas. This TV was in a bedroom but not directly in front of the bed. When I started to consider rearranging all my furniture I realized that it was time to take the plunge and get the mount. I am so glad I did! This TV mount is very functional and frees up so much space in my living room. It took my husband and I about 3 1/2 hours to put this together. Assembling the mount and then attaching it to the wall was very easy with excellent instructions and graphics. However, attaching the TV to the mount was a nightmare. My husband actually left to go get longer screws until I figured out some parts of the directions were unclear and found the correct way to do it. 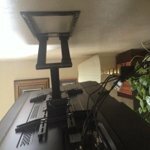 I would have given 5 stars if it hadn't been for the difficulty we had interpreting the instructions for attaching the TV. Having said that, I LOVE the functionality of the mount. I can move my 60" TV up, down, side to side, it swivels and it tilts. So no matter where you are in the room everyone can see it. I can get rid of my huge entertainment center and just buy a smaller media shelf to go under the TV. My family loves this mount and I love the extra space! I want to note that my husband had all the tools needed to install this mount. He used a level, a cordless drill with screw drivers, a bolt and ratchet set to tighten, and a stud finder. All of those tools aren't necessary, but it helped make the installation process easier. 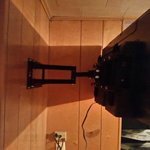 This mount is very sturdy and well made. My husband literally swang from it before he put the TV on it and it wasn't going anywhere. This mount does come with an HDMI cable, but I already had one.